We thought the scary driving part of our drive was over, and boy were we wrong. The minute we got off the ferry we noticed it was eerily dark. We then noticed that the traffic lights weren’t working. They weren’t even flashing yellow “yield” lights, like a normal broken traffic light. Oh no, there was NO POWER on Bainbridge Island at all. They apparently had a “bad” winter storm the night before. Now “bad” on the west side of the cascades means roughly 2 inches of snow. Oh and some wind. I’m not saying they’re pussies…..okay yeah, I’m saying they’re pussies. Get it together west side. Not only was there no power any where to be found, but people were driving like they had a pregnant lady in the car that they were rushing to the hospital. Consequently, these people ended up in a ditch. You deserve to be in a ditch person-that-can’t-drive-in-snow. Slow it down. Finally, we arrived to our destination; Jon’s parent’s house. They also had no power. They hadn’t had power for over 24 hours (!). It was freezing cold, but luckily they had a fireplace, lanterns, a wind-up radio and plenty of blankets. We all huddled up in a corner next to the fireplace, listened to the radio and proceeded to entertain ourselves with lots of wine and shadow puppets. We also attempted to play a game of LIFE, which turns out to be the most confusing game on Earth and gave up shortly after breaking it out. Here’s proof that we were huddled into one corner of the house. (this picture doesn’t really do this story justice, the flash ruined showing how dark it really was in there). We did have a really fun Thanksgiving break though. We had a huge feast and all fell into a deep food coma after eating copious amounts of turkey and stuffing. We also got to go visit my college roomie, Kayce, for a night which was really fun. 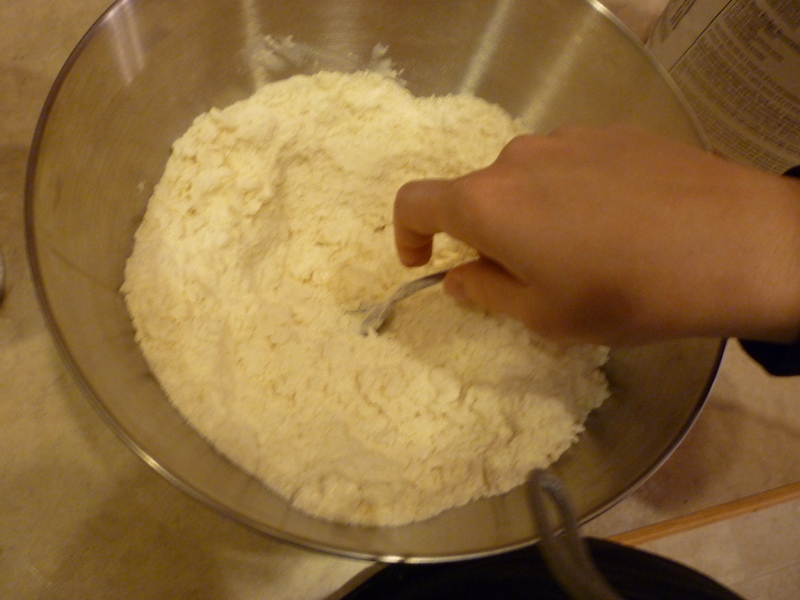 First, sift together all of your dry ingredients in a large bowl. Dump in your cup of lard. 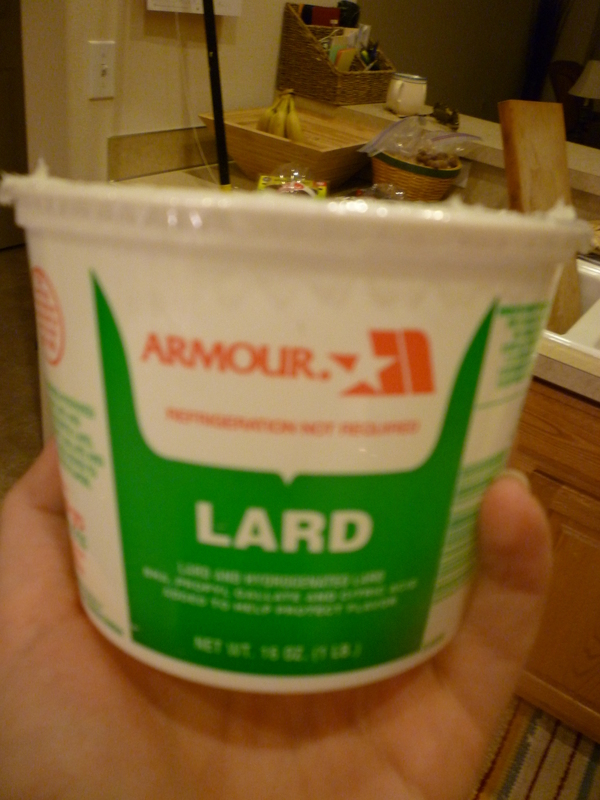 Could the word LARD be any more disgusting? Ugh, just say it out loud. Lard. And could they make this container look any older? 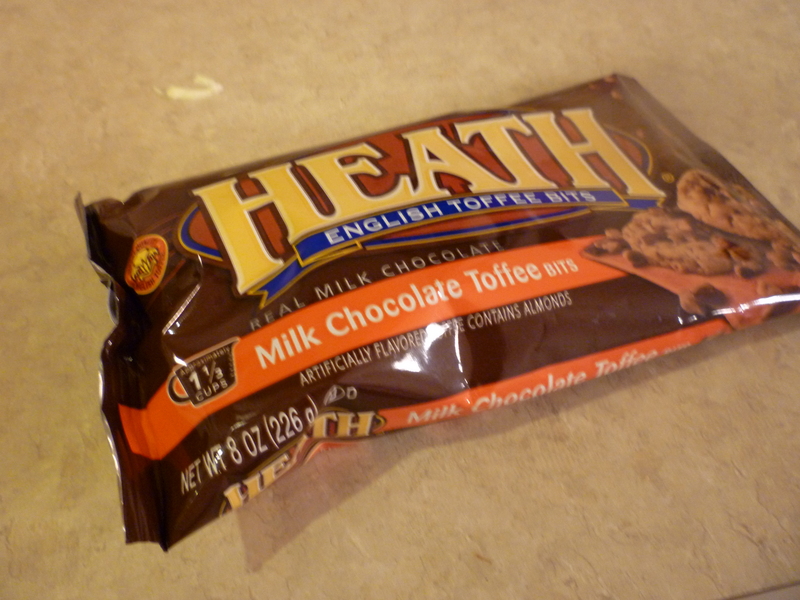 It looks like I’ve had this in my pantry since 1986. That makes it seem even more gross. 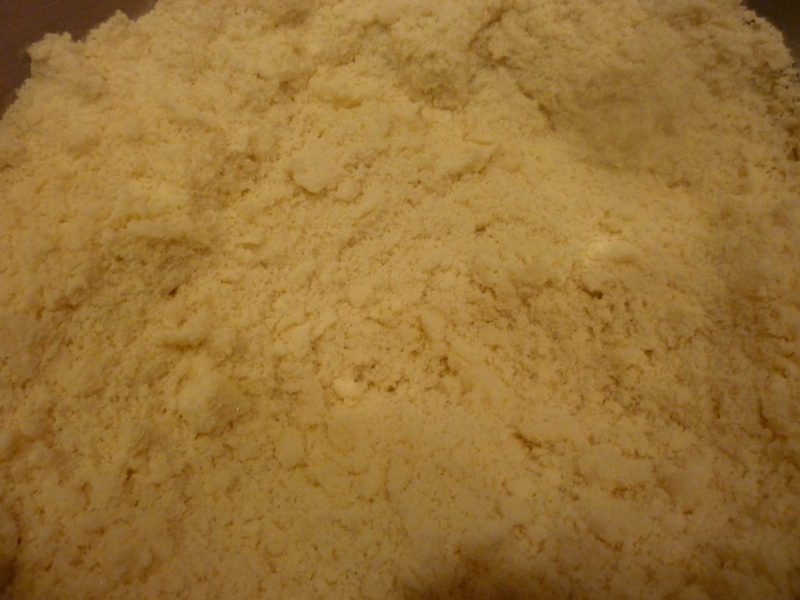 Now, cut your LARD into your dry ingredients with a couple of forks until it resembles corn meal. 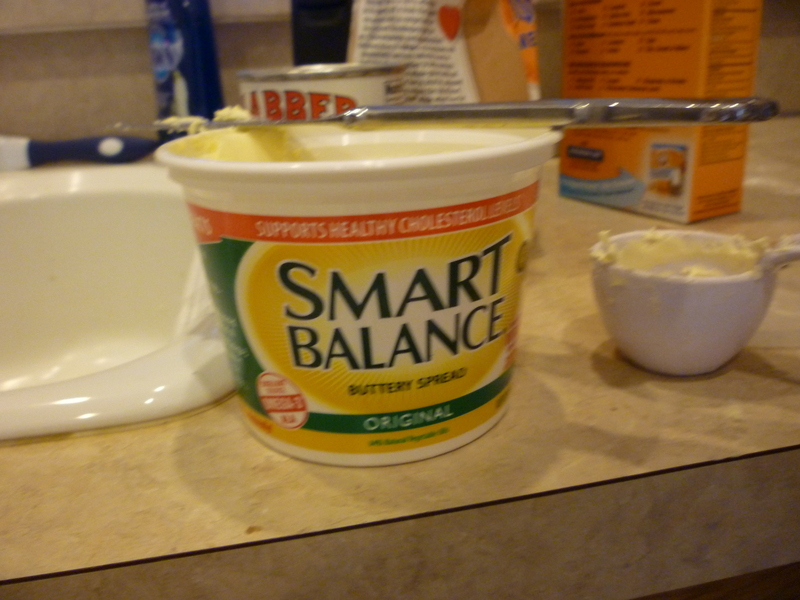 Close up of what the “corn meal lard concoction” should look like. 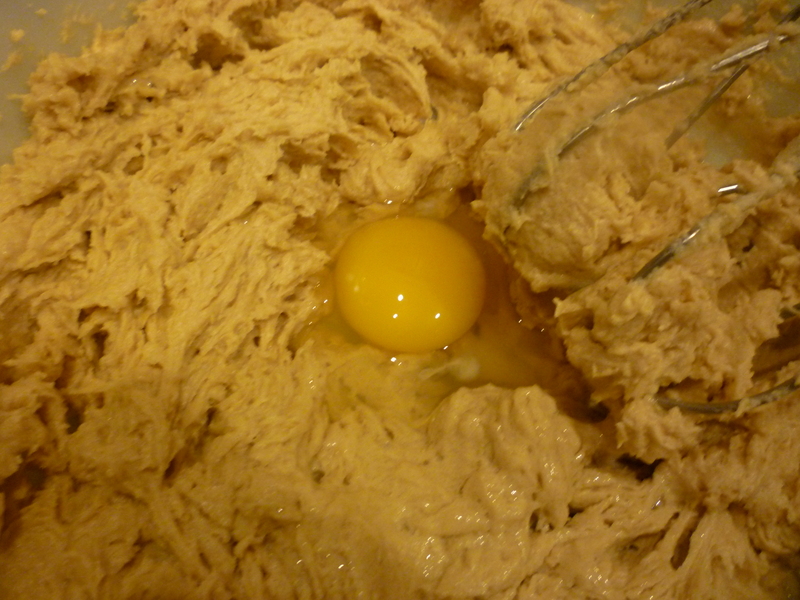 Now, add your eggs and almond extract. Stir to combine. This dough is going to be fairly dry and crumbly. That’s okay, it’s actually what you want. Preheat your oven to 350 degrees. 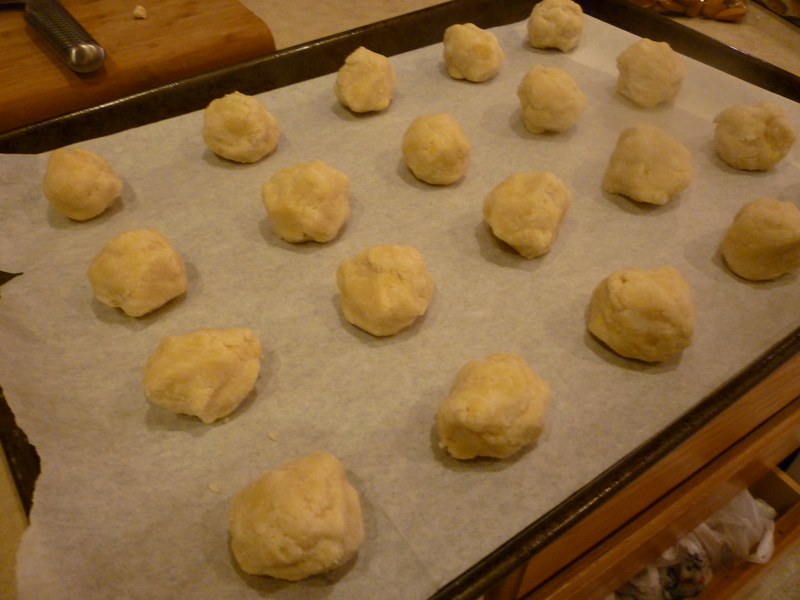 Line 2 cookie sheets with parchment paper and roll your dough into 1 inch balls. 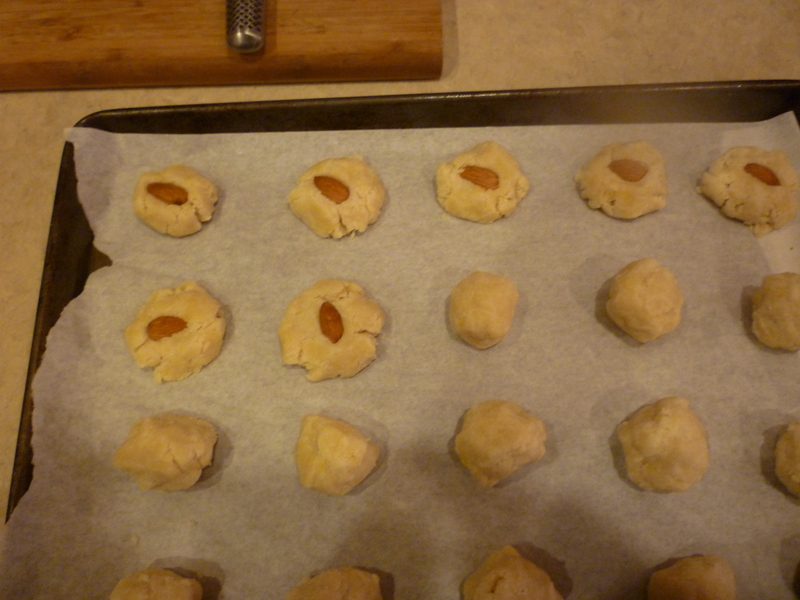 Place them on the cookie sheet 2 inches apart from each other. 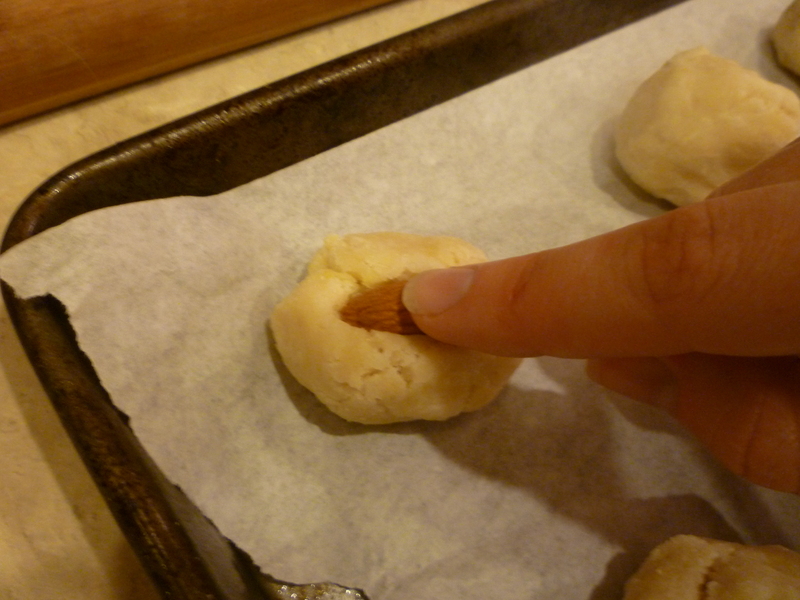 Press a whole almond into the top of your dough balls and shape the cookie into a circle. The dough is dry so it might crack a little, but just form it back together. Bake for 15-18 minutes. Make sure you eat one while it’s still warm. You’ll be happy you did. You could make a few batches of these and give them away as Christmas presents, they’re really that good. 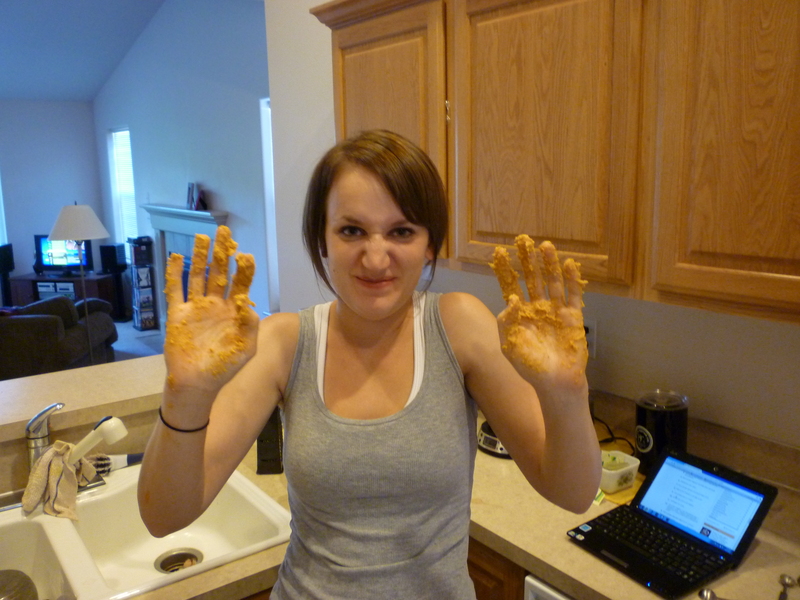 Would you like some oatmeal cookies? Well, you can’t have any of mine. But feel free to make your own. Add your eggs one at a time and cream them in, too. 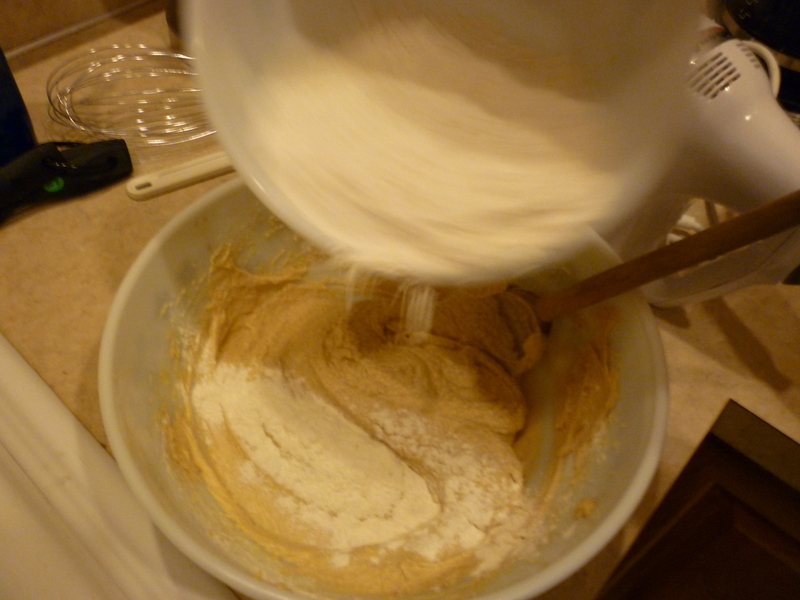 In a small bowl, whisk together flour, cinnamon, nutmeg, salt and baking soda. 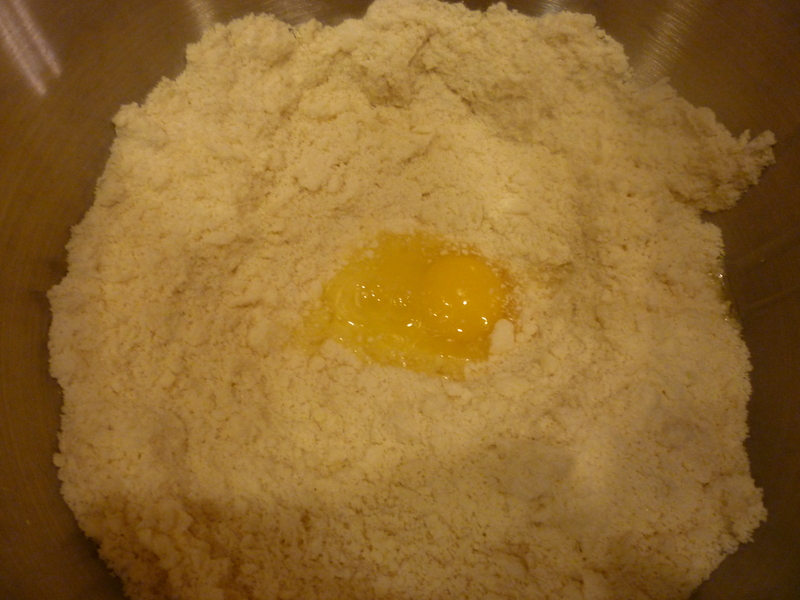 Slowly add the flour mixture to your wet ingredients a small amount at a time. 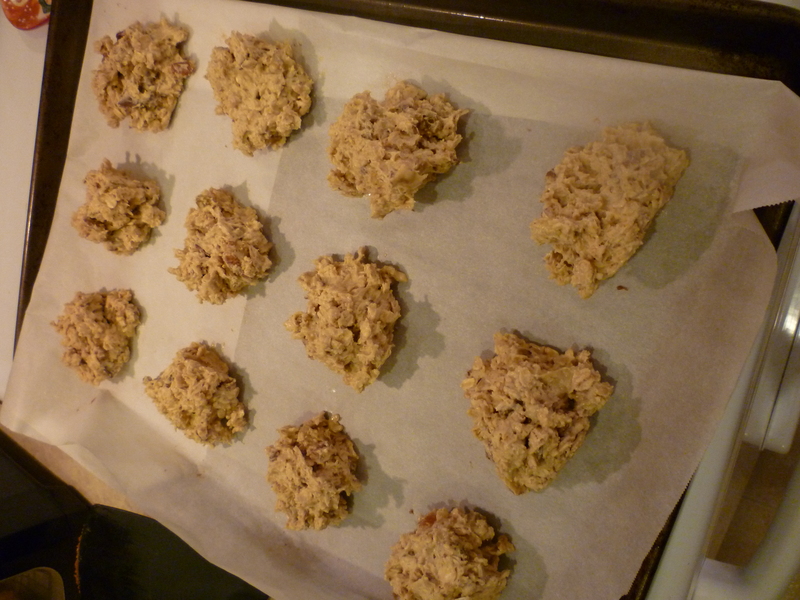 Spoon small mounds of cookie batter onto your cookie sheet with a piece of parchment paper. Bake at 350 for about 15 minutes, or until just golden brown. I gave some to the neighbors (my brother and his girlfriend, Sarah) and I’m going to give some to my parents today. This recipe made 2 dozen cookies and that’s too many for just Jon and I. But the rest of you can’t have any, because I already gave away as many as I’m willing to part with. 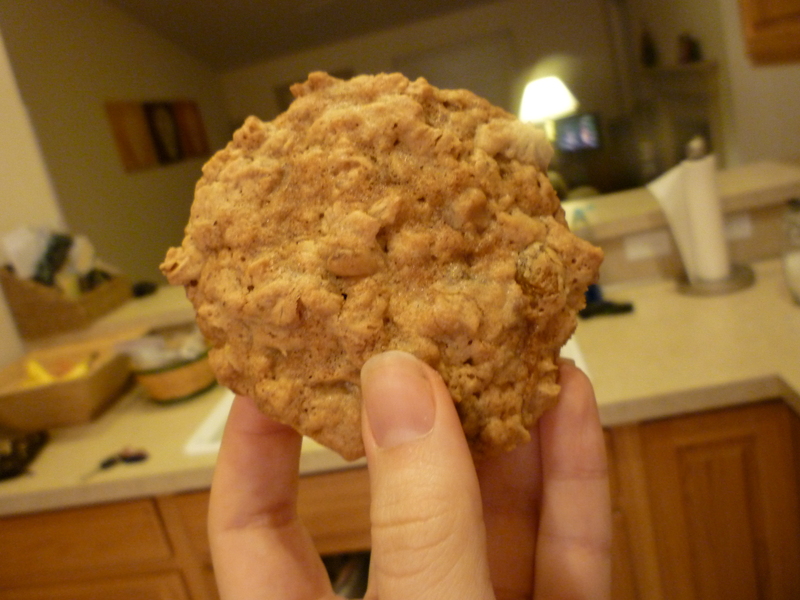 Make your own oatmeal cookies! 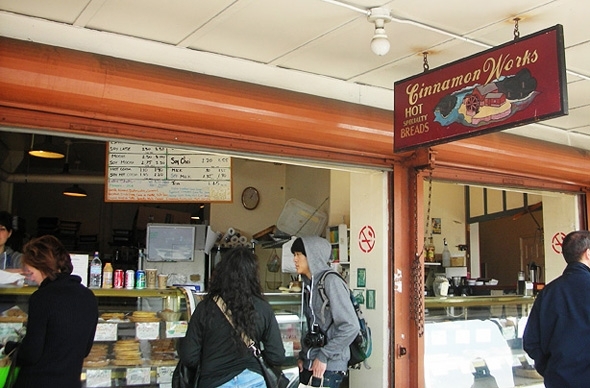 That is Cinnamon Works. It’s down near Pike’s Place Market in Seattle, literally just on the other side of the street from the market. They specialize in gluten free and vegan baked goods. 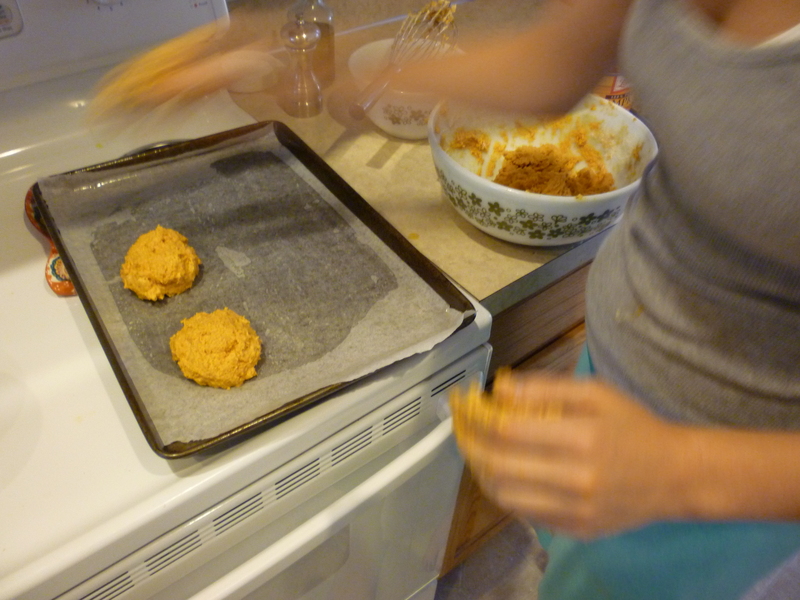 Although I am neither vegan or gluten intolerant, Jon took me here to get a pumpkin cookie when we first started dating. I would say this cookie is less like a cookie and more like a muffin top. But, whatever you want to call it, it’s delicious. I’ve created something that is really close to what they make. It’s vegan, pumpkin, muffin-like, and scrumptious. The only differences were the frosting on my version was a little less creamy and the outer layer on mine was a little chewier than theirs. Nonetheless, these are delicious and you need to sprint to your kitchen now and make them. I do mean now. 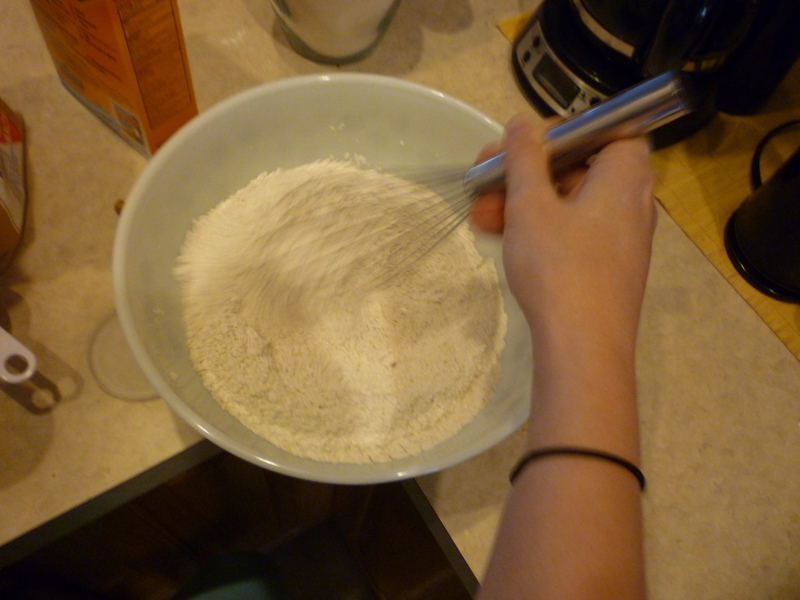 Start off by measuring out your two types of flour into a medium sized bowl. Add all of your spices aka the cinnamon, nutmeg, ginger and clove and also your baking powder and baking soda. Whisk together to combine. Nicely done. Set that aside. Whisk in the pumpkin, applesauce and vanilla extract. 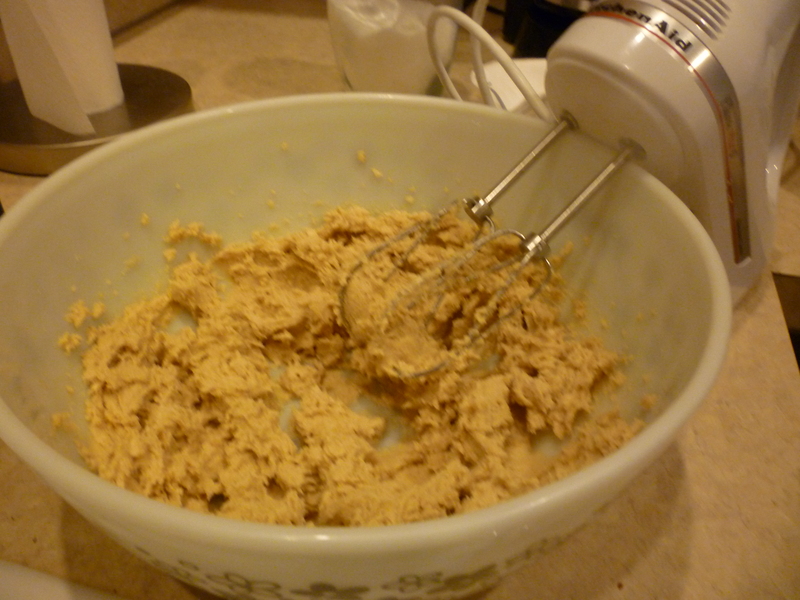 Whisk like a mad woman (man?) until smooth. Slowly add the dry ingredients until combined. I opted to use my hands for this last step. 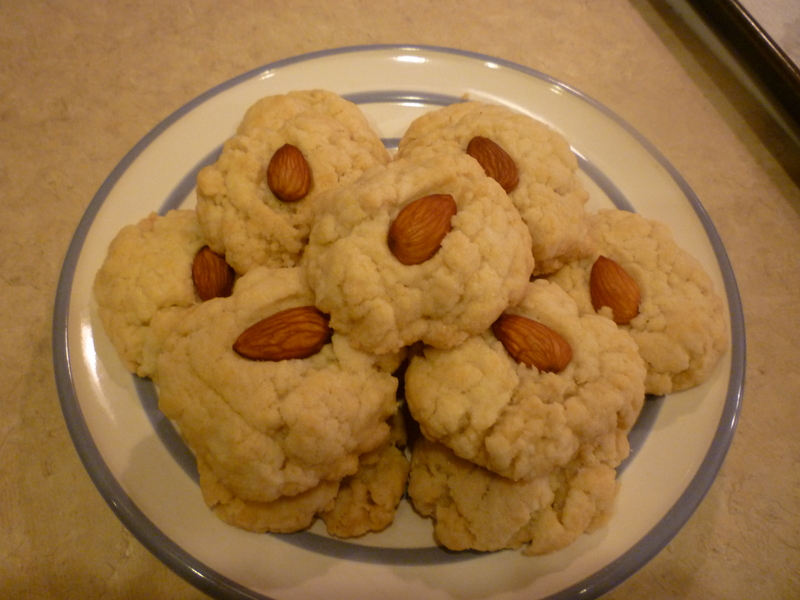 Place a piece of parchment paper on your cookie sheet and spray with cooking spray. This is the part where you can be creative; you can either A) make normal sized cookies that are conservative and acceptable to society or B) make them as big as your face just like Cinnamon Works does. I chose the latter of the two. Makes six, face sized, cookie-muffin hybrids. Bake for about 18 minutes, or until a toothpick comes out clean when you insert one in the top. While those are baking, make your glaze. Combine all ingredients with a spoon or whisk until smooth. When cookie-muffins are done, let them cool on a cooling rack. Then, add your glaze. 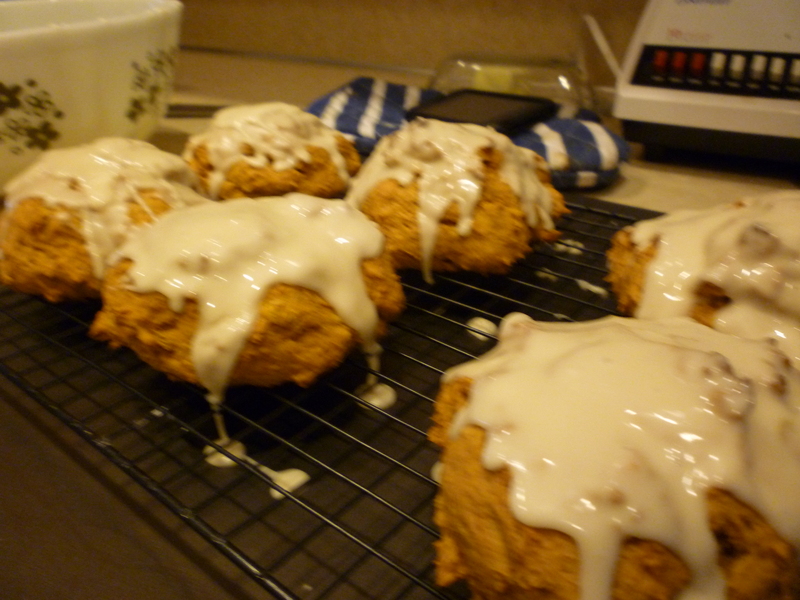 Make sure your cookies have totally cooled before adding glaze because if you don’t it’ll just melt all over the place. And there you have it! 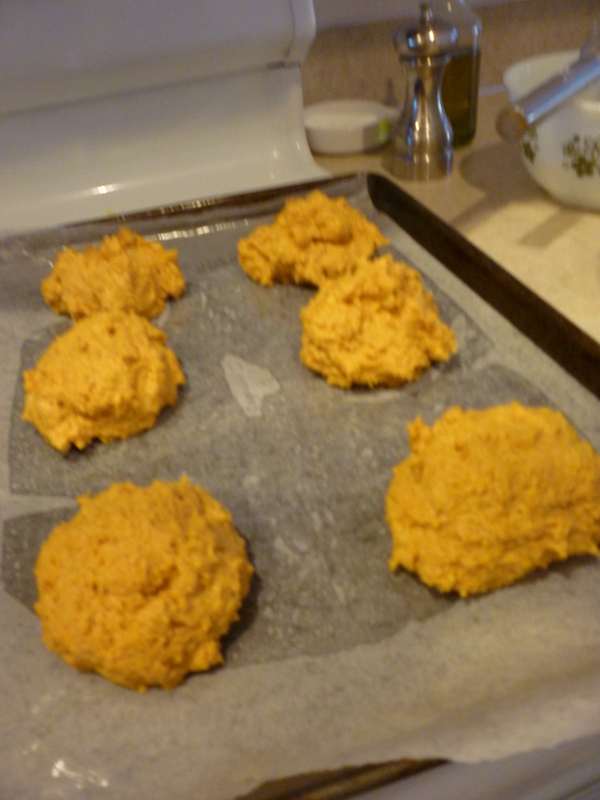 Vegan Pumpkin Cookies! Does anyone have any suggestions on how to make vegan friendly, thicker frosting? The Misadventures of Jaclynn Chan · 20 Something with a new job, new home, and new life.